We have in the shop the new pamphlet from Crimethinc Ex-workers Collective. Its part of a new anarchist outreach project that they’ve begun. Its very ambitious. You can pick up your copy for free in the shop, or order even more of them from Active Distribution. After months of labor and coordination, we are proud to present our most ambitious effort yet. 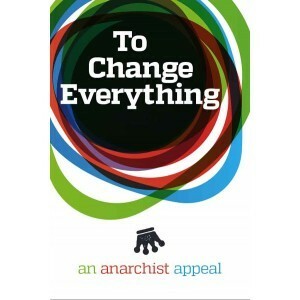 To Change Everything is a new multimedia overview of the anarchist project, updated for the 21st century. It is a primer for the curious, a polemic for the entrenched, a point of departure for everyone who longs for another world. To Change Everything includes a free full-color 48-page print publication, a video by Submedia.tv, a responsive website featuring the text in 6 languages (with 14 more to come), and a sticker and poster campaign. Collectives in 19 countries across five continents have prepared two dozen different versions of the project, each tailored to match the local context. Order copies to give out at events—distribute them around your neighborhood, college campus, community center, or workplace—leave one as your calling card when you interrupt business as usual. Put the sticker up on public transportation and anywhere else people might notice it. Circulate the website and video online, too! It’s high time for a project like this. All around the world, conflict is intensifying between human beings and authoritarian systems. We’re seeing uprisings from Bosnia to Brazil, autonomous zones in Greece and Rojava, fascist parties entering European parliaments. In the United States, successive waves of dispossession and injustice have swept new sectors of society into revolt one after another. The student movements of 2009, the Occupy movement of 2011, the unrest that spread from Ferguson in 2014—all of these have produced a population hungry for new visions. With faith in government, capitalism, policing, and all the other authoritarian institutions of our day at an all-time low, the time is ripe to open the way to liberation—and if we don’t seize the opportunity, others will exploit the situation for their own nefarious ends. To Change Everything steps into the breach. Burnt books for SaleRebel Footprints is here!